Use Dungeons Volume 3 on its own or combine it with one of our other dungeon sets. 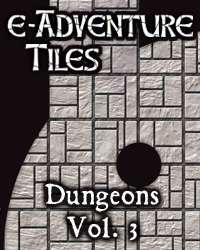 e-Adventure Tiles are designed by RPG cartographer Ed Bourelle and contain both color and grayscale versions. This download also contains two bonus poster pieces for Adventure Maps 1.0 which feature tiles from this set. This title was added to our catalog on April 19, 2004.